Are you the type of person who is always tinkering with different projects in your woodworking shop? Then you know the importance of having the best woodworking clamps available to help make your projects go more smoothly. Having the right clamp when you are woodworking can make such tasks as gluing, drilling, holding and stabilizing pieces of wood go much faster and get accomplished more easily. Woodworking is so popular you have a wide clamp selection available for you to buy but unfortunately not all of the products are good ones. That is why we have taken the time to write this article. In it we will review some of the best woodworking clamps that are available in the tool marketplace. We will also give you some helpful insight on what to look for in a clamp so you will be able to select the right clamp for the type of woodworking task you need to do. IRWIN QUICK-GRIP One-Handed Mini Bar Clamp, 12"
What Clamp Impressed Us The Most? One of the most important factors when selecting any clamp for woodworking is identifying what type of woodworking task you want to accomplish with it. Certain types of woodworking clamps are better at doing specific jobs than others. Here is a quick overview of the major types of woodworking clamps and what they are best used for. These types of clamps are great for a quick means to hold some wood together while glue is setting up or for other quick wood clamping tasks. They work by activating the trigger on a pistol grip handle and then sliding it along a bar; the clamp locks in place when the trigger is released. The big advantage of these types of clamps is they can often be operated by using just one hand. No woodworking shop is ever complete unless you have a few spring clamps available for you to use. These are clamps that are used for clamping pieces of wood very quickly when not much clamping pressure is necessary. They can be used for a large variety of different woodworking tasks. This type of clamp is used to both lift your wood off the surface of the workbench or table and hold it in place tightly at the same time. They work great if you need to access all surfaces of a piece of wood while working with it or for drilling multiple holes through a piece of wood. 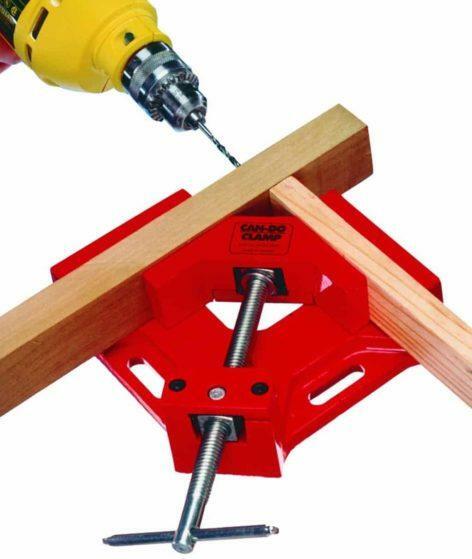 These types of clamps are great when you are gluing or screwing two pieces of wood together in order to connect them at a right angle. An example of this would be holding two pieces of wood in place while building a drawer for a dresser. 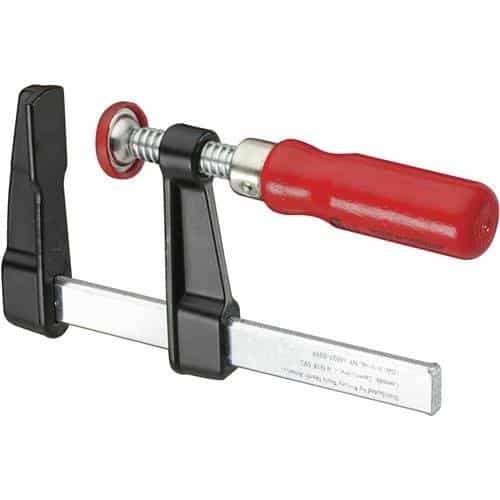 This type of clamp is used for holding a piece of wood tightly against a workbench surface or table top. It works by attaching to the bottom of the workbench surface and the top of the piece of wood being clamped down. It has a variety of uses when you need to hold a piece of wood in place on a tabletop for a short or extended period of time. Serious woodworkers choose these types of clamps when they are working with delicate pieces of wood that need to be glued together or held in place. They work great when you don’t want to damage the surface of such decorative wood finishes as cherry, maple, oak and walnut. Adjustable wooden clamps are very flat and wide so they apply pressure evenly to help avoid marking up the wood they are holding. These clamps are popular because they activate so easily. That makes them great for quick wood holding jobs that don’t require much pressure. They are definitely not the clamp of choice when you need a piece of would to be held firmly in place while you exert high pressure on it. These are the toughest type of clamps to put into place and they require the use of two hands to work them. They are used when a piece of wood needs to be kept firmly in place for short or long periods of time. There is no type of woodworking clamp that will hold a piece of wood in place better than ones that use a screw mechanism to tighten them. This is a clamp that is a middle of the road type clamp. It is easier to work than a screw style clamp but not as easy to work as a simple spring clamp. It also clamps a piece of wood much tighter than a spring clamp but not nearly as tight as a screw on type clamp. These can also be worked by using just one hand which makes them very convenient to use. Sometimes you need to put a clamp on very tightly in order to hold a piece of wood in place. When you do that you risk putting marks in the surface of the piece of wood you are working on. That is why it is nice to have a clamp model that comes with padded ends. These make it so you do not have to use a separate piece of wood or other material to protect the surface of the piece of wood you are working on to keep it from being damaged when you are clamping it. Irwin is a company that is known for making quality tools that last and this model clamp from them is no exception. You will find few quality woodworking shops that don’t have one of these easy to use all-purpose bar clamps from Irwin in them. It has a variety of helpful woodworking uses. 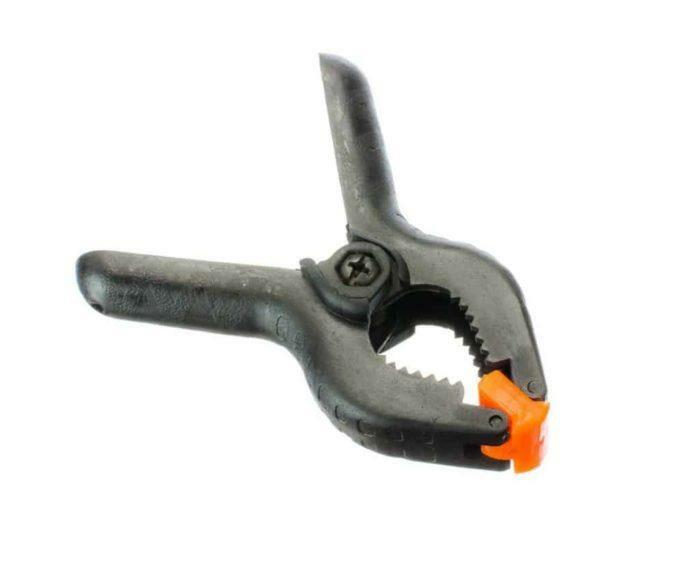 It can easily be used to clamp any woodworking task that requires a distance of 6 to 8 inches. 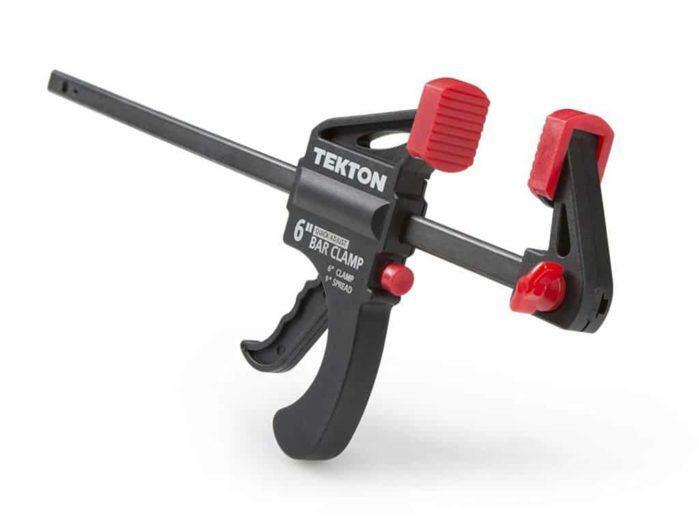 This sturdy clamp only weighs 12 ounces and it can simply be put in place using only one hand thanks to its pistol grip design. It can do any clamping job where 140 pounds or less pressure is required to do it. This bar clamp will hold up well over a long period of time too. It features a hardened steel bar surrounded by virtually unbreakable reinforced polymer resin. It clamping ends are ribbed to grip firmly and are nicely padded to help protect any wood you apply it to also. Here is a very special duty clamp from MLCS. 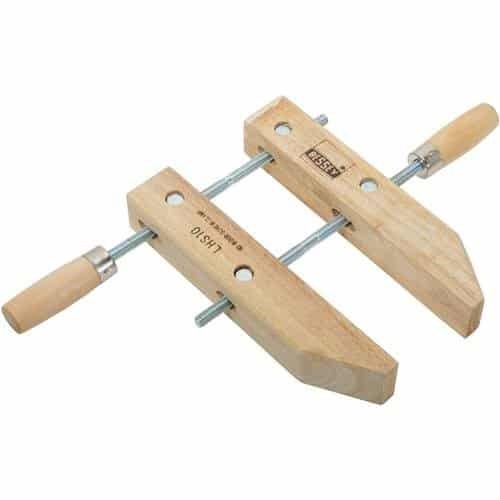 It is perfect for holding two pieces so you can drill through them, fasten them together or align them in place while you do other woodworking tasks on them. These clamps can hold pieces of wood that are up to 2 ¼ inches thick. They are great if you are building wood picture frames, table tops or anything else that needs to be put together with square corners or in a ‘T’ configuration. They are made of sturdy all aluminum alloy metal. A solid metal screw is used to tighten this clamp’s moveable jaws against the pieces of wood that it will hold firmly in place. This clamp works best if you fasten it down to your workbench or wood table top using its predrilled holes in its base. Bessey has designed a neat clamp with this model. These are great for lifting up flat, square pieces of wood. When you do that it makes it convenient to drill holes through the wood or be able to work on multiple sides of it. 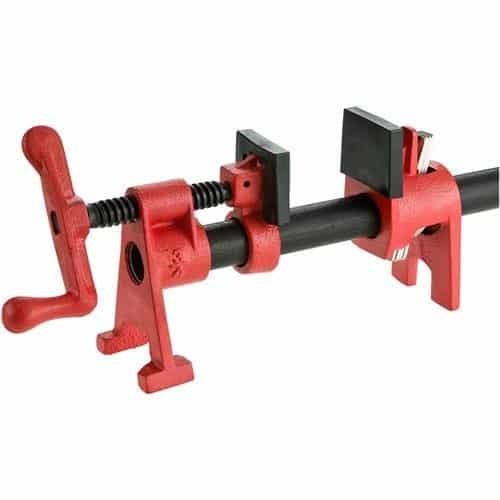 This is a solidly built clamp that stays firmly in place as you use it. It features a zinc coated tightening screw and cast metal jaws and supports. The jaw ends are coated with rubber to protect the wood you clamp with it also. The big drawback with these style clamps is that you need to buy 3/4'” PVC pipe to insert into them to make them work. That does allow you to cut the PVC to the exact size you need to make these clamps work perfect. 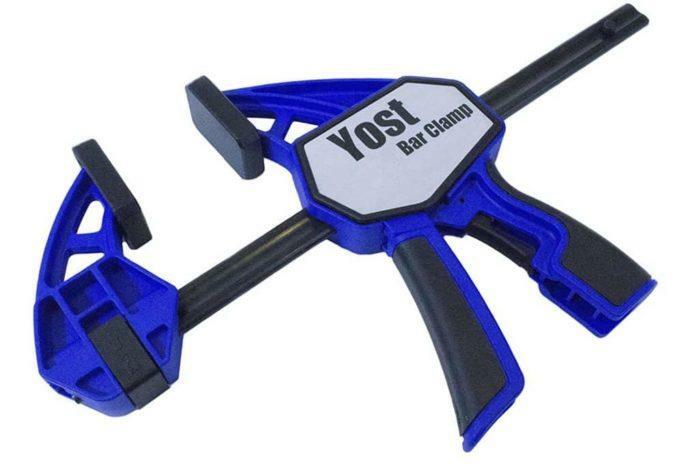 Yost has designed a really nice bar clamp with this model. It is bigger than the 12 inch bar clamp that we reviewed in item one at 36 inches but it still has very good clamping power. It has an easy to use pistol grip design that means you can clamp it on using just one hand. There is a built in release latch to help enable you to take this clamp off with one hand too. 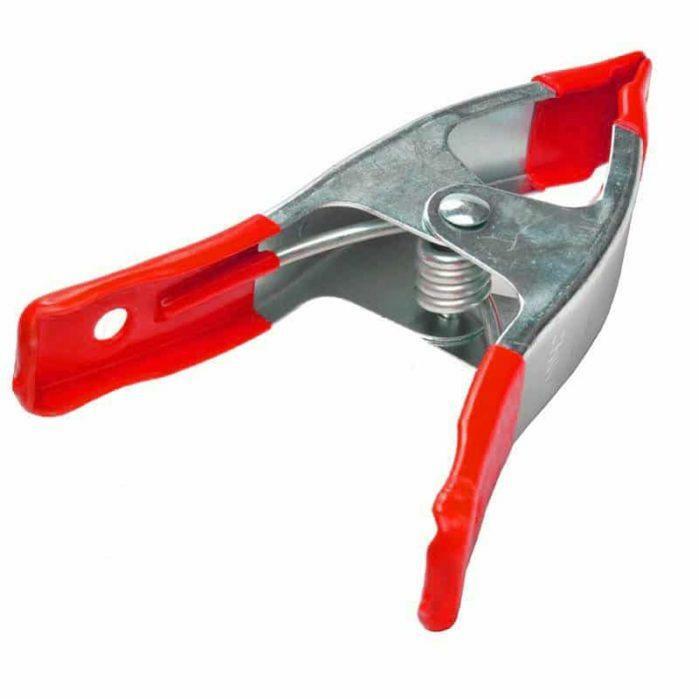 The jaws of this clamp are nicely padded and it can be locked in place for long periods of time if you so desire. It is made out of heavy duty plastic so it should last you a long time even under tough woodworking conditions. There is no way if you own a woodworking shop that you should find yourself without a few handy spring tension clamps and you will not find better ones than these ones by Online Best Service. They are the perfect clamping solution when it comes to clamping jobs that need to be done quickly and don’t require a large amount of clamping power. This set of 8 clamps is both affordable and easy to use. In just a few seconds you can have one or more pieces of wood clamped lightly so you can work with them. These clamps feature strong springs and they can clamp on anything that requires a 3 inch or less opening. They are also built surprisingly sturdy. Lightweight steel is used throughout the body to give them durability. The tips and handle are nicely coated with rubber to make them easy to grip and help protect the wood surfaces they will attach to. Make no mistake about it, all of these clamps work great and that is why they made our list of the best woodworking clamps. We did however feel that one clamp in particular stood out among them. That was the IRWIN QUICK-GRIP One-Handed Mini Bar Clamp, 12". This clamp had a lot going for it. It is lightweight and easy to use with just one hand for one. It can handle any woodworking clamping job up to 12 inches in width. This model Irwin clamp is built out of tough reinforced resin plastic and even the jaws on it are nicely padded. Without a doubt it’s a clamp that you want available to use if you are into doing woodworking projects. We recommend you consider adding one or more of these to your woodworking tool inventory.